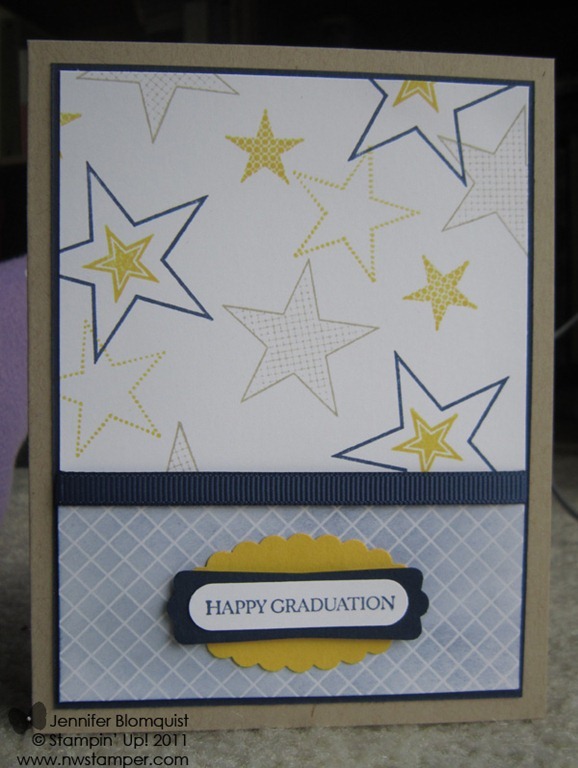 I know it is a little early to be thinking about school graduations. Though now that I think about it, I graduated college during the month of March, so I guess it might not be too early for some. Anyways, I was asked to design a graduation card for a stamp camp last week and was posed the additional challenge that guests at the camp would be making cards for kids attending one of two schools. So, that meant an unknown number of people would want a card in Navy and Orange while some other unknown amount of people would want Navy and Yellow! Well, never one to back down from a challenge, I put my thinking cap on and designed a card that was based around the common Navy theme and then allowed the creator to switch out ink colors and punch outs in the appropriate accent color. And it turned out even better than I expected. Then folks punched out their sentiment and coordinating shapes to finish it off. Every card was totally different but that was perfect! This way, even if two friends were given this card, they would still have their own personal and unique card. And it was fun to make to boot! I hope you enjoyed this early graduation idea and can see even more fun ways to tweak this design for Birthdays, Holidays, and more! Click here to shop online 24/7!